A couple of weeks ago an article (Elite cross-country skiing linked to increased risk of subsequent arrhythmias) was published regarding the high percentage of cross country skiers who have developed some form of SVT or Atrial Fibrillation (AF). This is not the first article that has been published indicating long-term exercise with AF. Interesting enough the Norwegian Birkebeiner study came up with a similar finding (ScienceDaily Feb. 10, 2010) and there are other studies showing similar results. I am writing this article to give everyone my personal insight into this condition so that they can have some sort of reference on how they might deal with this issue should they develop AF. I started to develop AF several years ago when I didn’t even know what it was. At first I thought it was cold induced asthma because the symptoms were similar to what I was experiencing. It wasn’t until Ernie Brumbaugh introduced me to a skier at the Noque who told me I might have SVT (a similar form of AF), which is an elevated heart rate induced by exercise, that I started to study and was eventually diagnosed by my cardiologist a couple years later. Since I was in the early stages it took that long to finally find the cause. Eventually, my AF became more prevalent and I decided to try some medication which worked great for a while but even that did not prove a long term solution. 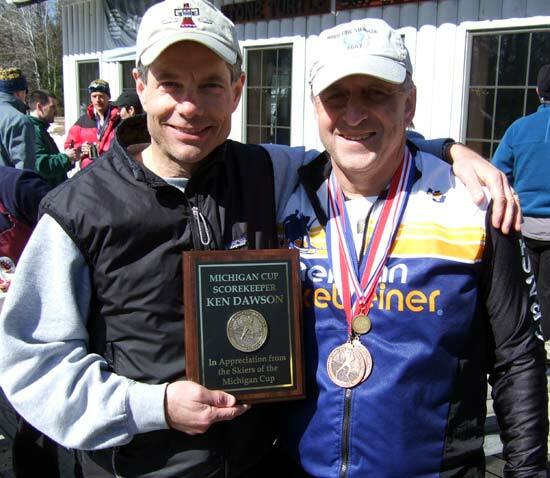 Ken Dawson (left) and Ernie Brumbaugh at a recent Michigan Cup awards ceremony. I finally decided on having an ablation procedure which in essence forms scare tissue over the veins where the electrical impulses are finding another path to take that bring on the AF. I went to the U of M Cardiovascular Center and had a very experienced doctor do the procedure that has been doing this for 15 years and does 300 a year. The typical procedure takes 4-6 hours and in most cases you can start exercising again in one week. The important thing to remember about my AF or another fit athletic is that it is not a life threatening condition. Even when I was diagnosed with this the doctor never said to stop exercising nor should I stop once I have the ablation procedure. He informed me that this is a minor tune-up and that the success rate is over 80% for first time procedure and if they have to do it again the rate goes to 90%. Obviously I am hoping this is my only procedure. The same doctor I went to also did another Michigan Cup skier several years ago and that person is doing fine today. There have been other Michigan Cup skiers who have experienced AF and a few of those had the ablation procedure completed and all are doing great. Cardiologists do not believe that long-term endurance athletics have a greater chance to develop AF but all these studies cannot be ignored without further research. I plan on making sure my doctors group at U of M examines the articles I am going to send them and have them tell if there is any correlation. After all, U of M Medical Center is a teaching hospital and they should be interested in knowing this information. One thing the articles did find that was a common trait in AF patients was that they had a large left atrium and a low heart rate. In my case I had neither of these. If I knew 30 years ago that I might develop AF by competing for so many years I still would not have changed a thing. I feel that the physical conditioning and the personal gratification I got from so many hours of training certainly outweigh a minor setback. Fortunately I do not have what cardiologists refer to as plumbing issues that are much more serious. AF is in the upper chamber of the heart and just like an old car once you change the plugs and wires you are ready to run like new. I hope to bounce back for this setback but at least I feel good that I became my own doctor and made my own choices for treatment. Hopefully, next time you ski by me I won’t be lying in a snow bank trying to bring my heart rate back into rhythm.